Cisco telepresence sales manager Peter Neidhart claims that videoconferencing is not designed to rival face-to-face meetings. Neidhart, who was speaking today to delegates at Access 2011 in Vienna, said that its systems are designed to be used in circumstances when face-to-face meetings are not financially or logistically viable. "Our stats show that only 7% of what is taken in during a speech is the content," he said. "The rest is communicated by body language and voice. There are a lot of factors to consider in communication and its effectiveness. "When you have to get a flight out to another country, get to the destination, find accommodation, the ROI of the travel really has to be considered. I would rather be spending time with my family, and then deliver a speech via telecommunication, than go through this." 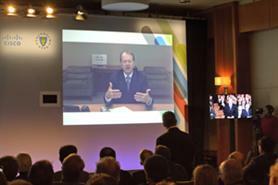 He added that the decision for businesses to use videoconferencing needs to be rational, based on efficiency and cost.